Built in 1901 by Armstrong Whitworth, Newcastle upon Tyne. Length 207.0 ft Breadth 36.0 ft Depth 13.7 ft Gross tonnage. Built for the Amazon Telegraph Company with cable machinery etc., being supplied by Johnson and Phillips. The double combined paying out/picking up machine was mounted on the upper deck. Hauling capacity was 20 tons at half a knot or 5 tons at two knots. Three bow sheaves 4 ft 3 ins dia and one stern sheave 3 ft 2 ins dia were fitted along with three cable tanks. On the expiry of the company’s concession in 1945 all telegraph equipment, stations etc. were handed over to the Brazilian Government. Viking (2) was handed over to Fundaçao Brasil Central and used for exploration. 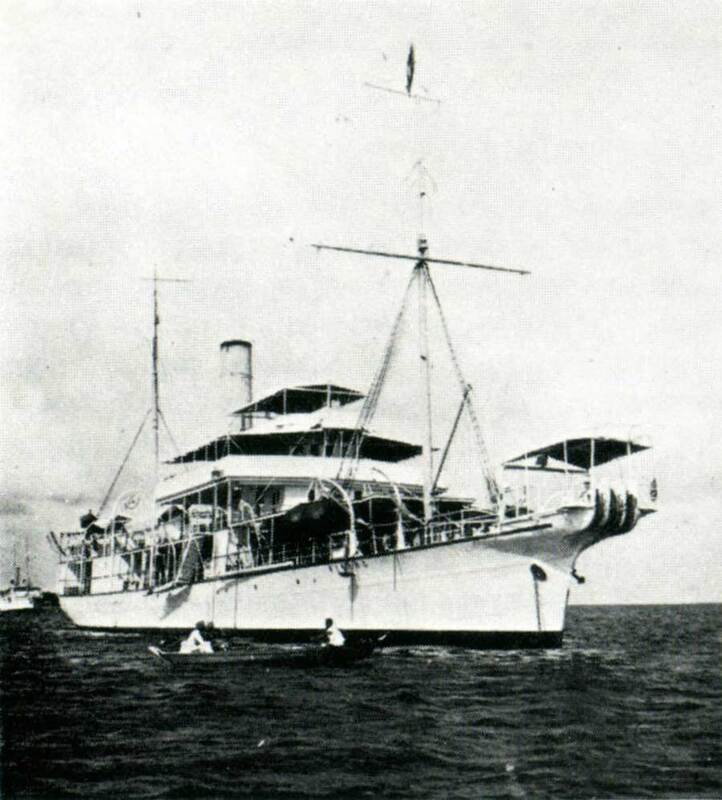 Ran aground off Para, on 19 June 1950, broke her back and sank. This story from The Electrical Review, Vol. 54, No. 1382, May 20, 1904, gives an interesting insight into some of the unusual problems which cable ships could encounter. A fault having broken out, and having been localized at a spot where the cable was laid in one of the numerous side streams or ‘paranas,’ out of the strong current of the main river, the Viking proceeded to its repair. After grappling for some time without success, she moved about a mile down stream. Here the channel passed close under a fringe of high trees which seemed a favourable position for hooking the cable. The first drag proved the surmise to be correct, and the bight having been duly lifted and cut, one end was buoyed, and picking up commenced towards the fault. Half a mile or so had been recovered when the cable left the open water and led right into the coarse grass, called capim, which everywhere fringes the low-lying banks of the Amazon, and which frequently floats in immense masses on the surface of deep water reminding one very much of the “sud” on the Upper Nile. In this instance there was 12 ft. of water alongside it, and picking up was continued in the hopes of being able to pull the ship through to the other side, distant about a mile. The situation was certainly novel, and soon difficulties arose. The circulating pumps got choked with grass, and, to make matters worse, water had to be supplied to the boilers, to enable the picking-up machine to be worked, by means of a suction hose put over the side and connected to a hand pump. Gradually, as the vessel proceeded, the grass in front became more and more compact until the cable led up and down, and it was obviously necessary to cut away the obstruction. A couple of hour’s work by all available hands armed with knives, choppers, and other cutting implements cleared a way for the cable and the bow of the ship, and the machinery was again started. Before long, however, the neighbourhood of suspicious looking young trees was reached, and the ship became stationary. On making a hole through the grass and pushing down a pole, 9 ft. of water was found, and this being 1 ft. less than the ship could float in, the cable was accordingly cut, just above the surface of the grass. The end remained sticking up, and appeared to have no inclination to retire from view. Over half a mile had been picked up, and but for the shoal water doubtless the whole length would have been recovered, and a somewhat bold proceeding justified by complete success. Pulling a ship along by means of a good strong cable is one thing, warping her back, stern first, by running out Kedge anchors, is quite another. Grass had closed up behind, leaving only a narrow channel barely sufficient to permit the passage of a boat. The first Kedge anchor promptly came home without the ship showing any signs of moving. A heavy grapnel was next banked behind the anchor, but those two proved insufficient, and matters began to look serious. As another recource grapnels were now run out over the bow, carried along the grass to the stern of the ship, and hooked deeply into the impeding mass, which was then hauled forward with the winch. The excitement of falling into holes was varied by a snake hunt and the killing of a fine specimen about 8 ft. long. After a few of those novel drags had been made and the stern cleared, the ship began to move, and gradually left behind a compact mass of grass and weed, which appeared almost solid, and which had extended from the bow to about midships. By this time it was dusk and the work had to be abandoned. Myriads of young mosquitos appeared, giving us a pretty good idea of what our experience would have been had the season been a little more advanced, and their biting powers fully developed. In the early morning, the engineers having made the necessary alterations, and cleared the propellors of grass, the ship was worked out, using the high-pressure cylinders only; and the choked pumps having been cleared, cable work was resumed and the repair duly completed. A considerable length of cable had to be abandoned. The channel has completely changed and where four or five years ago 14 ft. of water existed is now an island with fair-sized trees. Under this the cable goes, and it is too deeply buried to be recovered.